Saw stands just make a handyman’s job easier. A good stand should be sturdy and easy to use, at the same time, it should be easy to transport and to store. 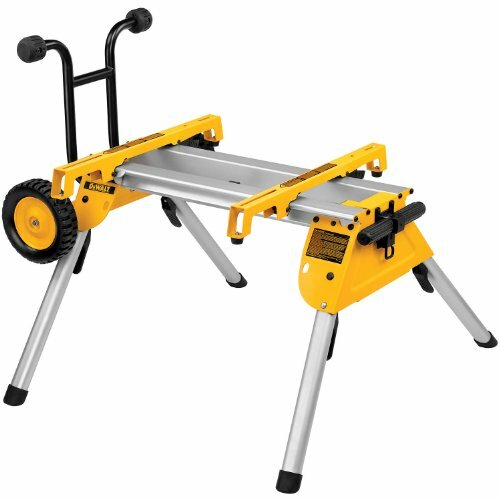 The Dewalt DW7440RS Rolling Saw Stand is one of the stands in the market today but does it stand up to its hype? Yes, it absolutely does. After taking a closer look at the this Dewalt saw stand, I have finally understood why so many professional and amateur home improvement junkies like it. It is simply the best in its category and is definitely worth the price. For a more in-depth look at it, here are some the stand’s best features. The design for this Dewalt Saw Stand has clearly been well thought-out. One evidence of that are the feet that have a nearly-splayed appearance. They stick out at almost 45 degrees from the body of the tool. This feature helps give the stand a good deal of stability, so much more than what you would get if the stand had legs that stood straight out. With it, you won’t have to worry about the stand toppling over when you place your table saw on top of it. The stand has been made so that it is at a comfortable working level when the saw is attached to it. This minimizes strain on the user’s back and also makes it ideal for use with a variety of saws. This helps to connect and to detach the saw to the rolling stand so much easier. With it, you won’t have to spend so much time fumbling around complicated locks that keep your saw put while still keeping the saw in place when it is being used. It seems like every power tool or power tool accessory today comes with rubber on its feet, one good example is the RK9000 Jawhorse. Why is that? Well, there are several reasons. For one, the rubber feet provide much-needed traction with the ground. This means that the tool does not move around so much when it has the rubber feet on. Rubber feet coverings can also be found on the Dewalt DW7440RS. Also, the rubber helps protect flooring from getting scuffed and damage. It is definitely a feature that you should look for in any stand you want to buy. The stand stores away easily, plus it is also very easy to transport with its built in wheels. So it does not matter that the stand is 33 lbs, it can still be easily wheeled around on its heavy duty rollers. The wheels even stand up to the duty of needing to be wheeled around with the saw attached. The response to the tool from dewalt.com users has been overwhelmingly positive that it received 6 five-star reviews out of 7, with the 6th reviewer giving it a score of 4.9 out of 5 stars. Despite much acclaim, there are still those teensy details that many users do not particularly like. For one, many complain that the rubber covering on the feet tend to slip when the stand is placed on top of the snow. One user found that a bit of glue on the inside of the stand of caps help to keep the feet off. Of course, other than the most extreme conditions, the rubber feet are going to stay in place and keep traction on the stand and the floor. Another issue has to do with the stand design, some users said that they are a bit weird how the feet of the stand sticks out. This, however, is necessary to keep the stand as stable as possible without sacrificing weight and height. Anyway, the separation between the back feet is not that wide and they are not at all obtrusive. Plus, the feet fold up nicely and can be stored without trouble. Check out the latest price from Amazon. You can also get another amazing saw stand the Bosch TB4, which like the Dewalt also rolls away easily. You can read more about the DW7440RS from the DeWalt website, you can also head on to Amazon.com for more information on it. If we had to pick out a table saw stand that works for us, then it would be the DeWalt D7W440RS. It is such a great tool and as many of the commenters have said, it just made our table saw that much more portable.